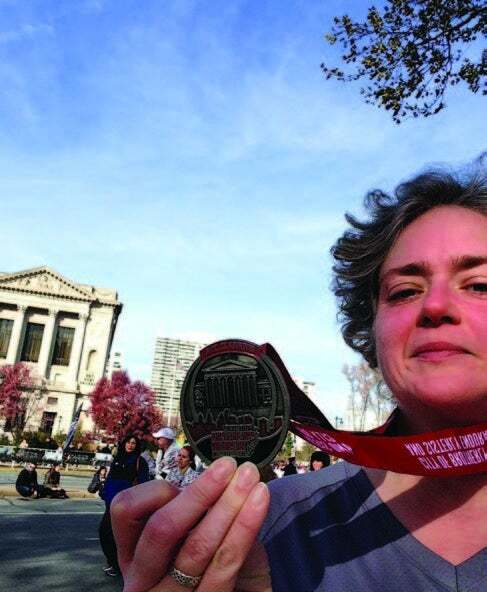 The recent release Tales From Another Mother Runner includes many inspiring stories. Wake up on the first day of spring, roll into your running gear and wander downstairs for a snack before setting out. Notice the outside temperature is 14 degrees. Blink a few times, then dash back upstairs to swap out the kicky capris you’re wearing for lined tights and a fleece jacket. Ponder mittens but decide you don’t want to carry them for most of the run, because you know you’ll want to claw them off of your hands 10 minutes in. Lace up shoes and head outside. Feel the moisture in your skull freeze. Sigh heavily for a second or two. Shake unmittened fist at the low, gray sky. Then go. Spend first mile remembering the mantra, “Never judge a run by the first mile.” Because this first mile, like so many previous first miles, bites the big weenie. You think about a nice warm cup of coffee and a bowl of steel-cut oats drowning in maple syrup and butter. You obsess about the weird little ache in your right IT band and how it has to be the sign of something awful. And you know this running thing is a stupid way to start a morning when it is 14 degrees outside and you are old and fat and slow. But mostly you think about that oatmeal. Around mile 3, you experience what you’ve been calling “the Dumbledore effect,” after the scenes in the Harry Potter movies and books where the wizard gathers up his memories with the tip of his wand and puts them in the Pensieve, which is the stone, birdbath-like dish where thoughts can be sorted and stored for later viewing. Running is your Pensieve, the place you can put all those mental cotton-candy wisps you accumulate over a day, a week, a life, so you can look at all of them objectively. You Dumbledore your way through miles 4 and 5 too, sifting through various kid crises like your tween daughter’s poor organization skills and your 8-year-old boy’s addiction to video games. You wonder about your career, if you’ll ever sell another book proposal or write anything worth keeping. You decide leaving the mittens at home was the right call while you unzip your jacket just a smidge because you are overly toasty. The 14-degree air feels delightful now. You also worry about your aging parents, how far away each one lives, and wish you had a sibling who could take some of the load. You make a note to put gas in the car and, maybe, while you’re out, get some ice cream. Or maybe those iced cookies you like from Panera. You let a lot of it go because there’s nothing concrete to be done about any of it, and it’s hard to maintain that much angst when your legs have found a rhythm. You pull out a gel from an outside pocket in your fleece jacket just before mile 5 and discover the cold has morphed its consistency to that of toothpaste. It’s also your least favorite flavor: peanut butter. Slurp it down anyway because you could use the jolt. You move your emergency gel—the one you carry but don’t think you’ll need—to an inside pocket to warm it up a little, just in case. Then it hits you that having a least favorite gel means you are a real runner. After mile 5, you turn around, cross the street and head back the way you came. You love to run an out-and-back because you can convince yourself it’s not a 10-mile run, but, rather, a 5-mile run you do twice because you have to get home somehow. You’ve chosen this particular route carefully. The “out” is uphill, which makes you strong even as it ticks you off, especially the near vertical incline at mile 4 that makes you want to vomit three-quarters of the way up. The “back” is blissfully downhill, which feels like flying when your legs are tired and always leads to negative splits. Both knowing the term negative splits and achieving that state makes you feel like a badass. Because you live in a town where there are a surprising number of runners, you play the waving game, in which you wave at every passing runner, just to see who waves back. Women always do. So do men about your age. Young men never do, for reasons about which you can only speculate. It’s hard to be young and male. Young men are told all that matters is being faster or stronger or richer than the guy next to you, which makes it so hard to focus on anything else like, say, that slow, old lady waving at you. It’s hard to be young and female too, but for different reasons, like never feeling you’re pretty enough or kind enough or determined enough to be worthy of love. You wouldn’t go back, even though you do miss your 25-year-old hips and knees. You could be wrong about all that too. You’ve been wrong about a lot, frankly. For instance, take how you thought you would never, ever be a runner. Through miles 7 and 8, you remember how freaking hard it was just to get through 1 mile only a couple of years ago. You were driven to run when a friend’s snapshot showed you just how much weight you’d gained in your late 30s. You recall how 5 minutes of running was about all you could stand before you had to slow to a walk and how only 30 minutes of a run/walk cycle would leave you wrung out and breathless. And, now, here you are, out on runs that span hours. Which doesn’t mean they are easy. The size of the challenge is still just as enormous; the specifics of the challenge have mutated. You no longer worry if you can just keep your legs moving for a mile. Now the worries are about seeing how far you can go. Then, once you get a half marathon under your belt, which is why you’re out here in subfreezing weather on the first day of spring running 10 miles in the first place, you plan to see how fast you can go. There’s always something else to reach for, with running and so many parts of life. It’s never easy, and the only answer seems to be persistence. Which is a lot of thinky thoughts, you think, for such a simple run. Your Garmin bleeps to let you know you’ve started mile 9, which you convert in your head to a simple phrase: 1 mile. You try to forget the other 9 you’ve just done and how nice it would be to just sit for a second. Those previous miles are in the past. Right now, you only have to run 1 mile. Just one. You learned this during child-birth, this trick of forgetting the past contractions so you can focus on what’s happening right now. It didn’t work terribly well in the teeth of labor; it seems to work on the long runs, as long as you don’t think too much. Which is fairly easy by this last mile. Only two thoughts occupy your brain: This is how horses feel when they can see the barn, and, man, you really need to pee after being out in the cold for nearly two hours. Then you are home. You grab a glass of chocolate milk on your way upstairs—climbing the stairs feels alien after running so long and your legs are confused—and bond with your foam roller before luxuriating in a nice, long shower. Or that’s the plan. What really happens is you roll out your quads while grousing at the children to do their dang chores and rush through your shower be-cause you forgot the oldest one needed to be at the mall selling Girl Scout cookies about 10 minutes ago. For a brief moment, you wish you could put your running shoes back on and head out again. Instead, you grab your car keys and go. From Tales From Another Mother Runner © 2015 by Dimity McDowell and Sarah Bowen Shea (Andrews McMeel Publishing). Reprinted with permission.